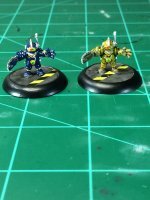 Let's start off the the second hobby update of the year! By going backwards! 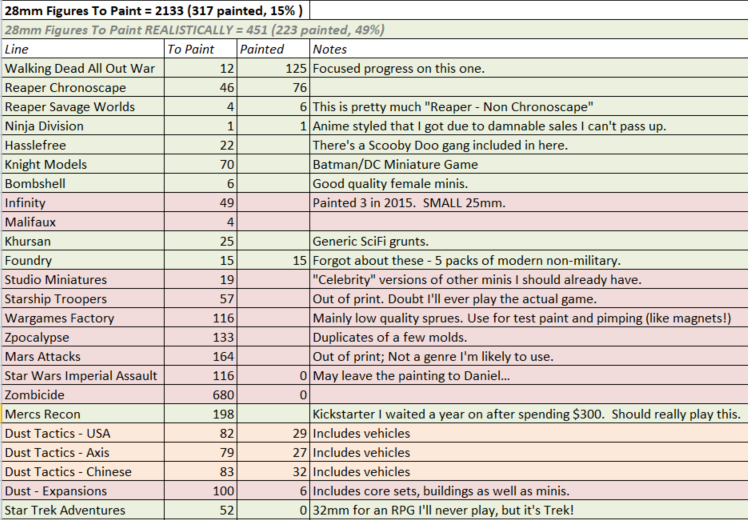 With my net gain of 13 minis painted over the course of 2018 I move forward by updating the spreadsheet by adding 11 minis to the "To Paint" list. 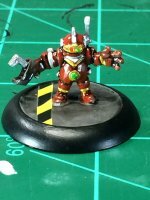 I can blame Daniel, as he wished to purchase Mecha Paint from Miniature Market, and I always have wishlist filler for free shipping thresholds. Last week I took my first airbrush class at Lowe Mill without finding an excuse to put it off or not go! I learned how to take the airbrush apart and put it back together without breaking it. This was what I really wanted to learn. I painted dots, and dots, and lines. 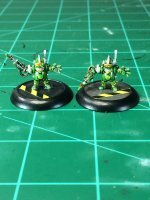 Hardly any were what I was trying to paint, but you've got to start somewhere. I did lots of things wrong. I may have done some things intentionally wrong so I could ask questions. In the end, I did a lot of stuff wrong and a couple of things right. Then I came home and practiced. At home I noticed all the stuff I didn't have that was making everything harder than it was during my lesson. A regulator coupler for the airbrush instead of fiddling with the compressor. Light. If I'm doing this at home in the garage, I need better light. And other stuff. Other stuff is always good too. Stuff was ordered from Amazon. Stuff took a while to arrive, and 1 shipment is stuck in Mesquite, TX for an extra 2 days (so far) for no good reason. 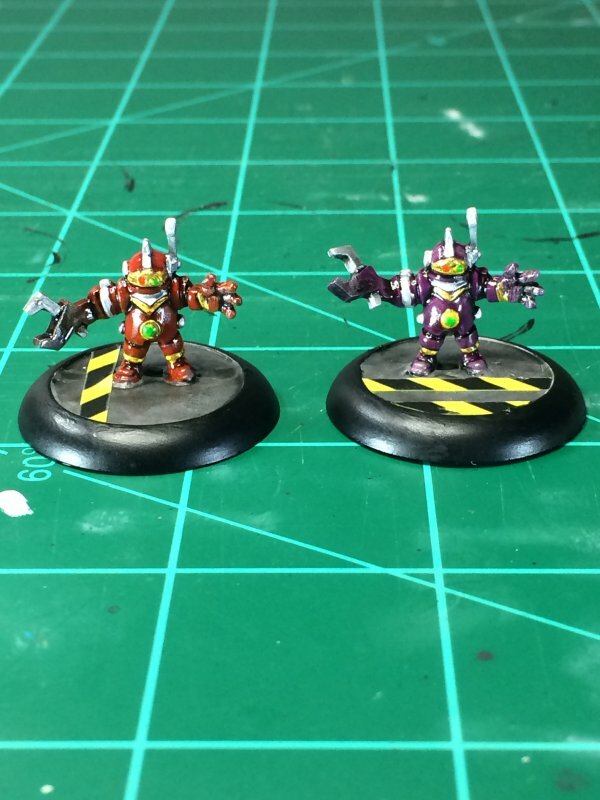 Even though I'm still painting dots and lines on paper, there are now 5 primed minis from Zombicide to practice on. I have zero faith these will be usable in any way. They're for practice. 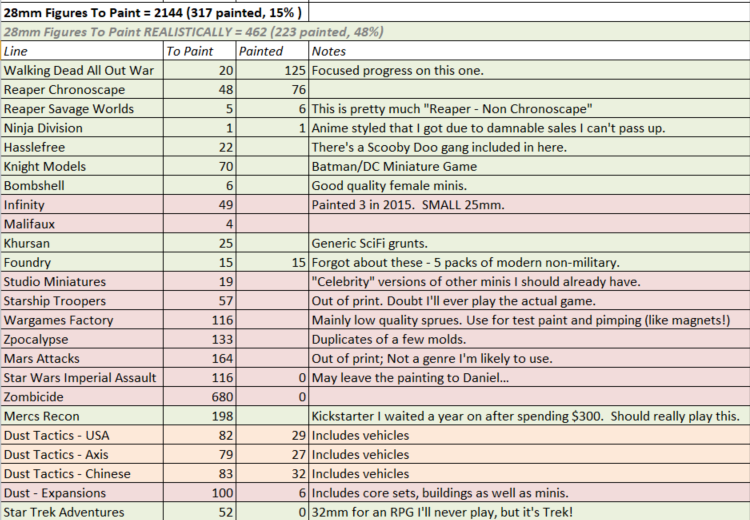 My painted mini spreadsheet doesn't include everything, so it may be a little misleading. I'm leaving off little, inconsequential scenery and scatter items. WizKids has pre-primed minis, and I'm drawn to their furniture because I think of all this gaming scenery as a glorified doll house! These blister packs have all sorts of little doodads. 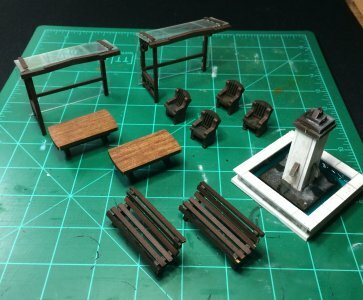 I've picked up a couple of library sets along with other miscellaneous furniture packs, some of which may be prime "how's this wood color airbrush paint work?" candidates. This is also the week I'm going to start putting that model tank together. The box has been opened. The plastic bags have been split open and sprues of plastic are ready to have parts clipped and glued! I'm definitely getting my $35 worth out of this tank. 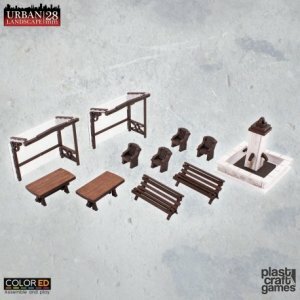 Back during this year's Black Friday shopping (maybe), my Miniature Market order needed a little padding to reach the free shipping threshold so I tossed in the Plast Craft Games Urban Furniture set. Plast Craft makes a nice little assortment of low-effort scenery. Slightly high density foam with pre-printed graphics along with laser cut wood accents for the buildings that I've gotten so far. Interestingly, for each building I've made I always do something wrong but manage to cover it up well enough. That kept true this time. Compared to the cover pic, the 2 Bus Stops are mirrored from how they should be. My fountain is a little Pisa inspired. A couple of the wooden pieces on the benches didn't get cut very clean. Way to start off 2019! None of this is horrible. I added my favorite water feature to the fountain, but I got air bubbles I couldn't completely get rid of. I can touch up the marred wood with some paint here and there and it will end up lookng fine. My real reason for making this my quick one-off project to start off the year is that now I'll force myself to make the 4Ground Playground pieces Keith gave me a year ago. The Potham City Park needs a child friendly area... for the zombies to find snacks? - This Sunday I take my first art class in decades as I follow through with "How to use my airbrush". I'll save whatever details there may or may not be until later. - Next actual hobby project is a 1:48 Tamiya M1A2 Abrams Tank. I'm not sure when the last time I made an actual plastic model was. I picked this up on my trip to HobbyTown last July-ish. - My map-tile making project has stalled out and I'm going to see why I've lost my gumption there. It's that time of year to reflect back and plan forward. I like planning forward as having a goal helps to keep me from sitting like a knot on a log. But I shall start with looking back and checking off that reflection part. This year Russellmania was more of a hobby blog than anything else. It helped hold me accountable for making progress on all the stuff I've accumulated to paint over the years. So how'd I do? 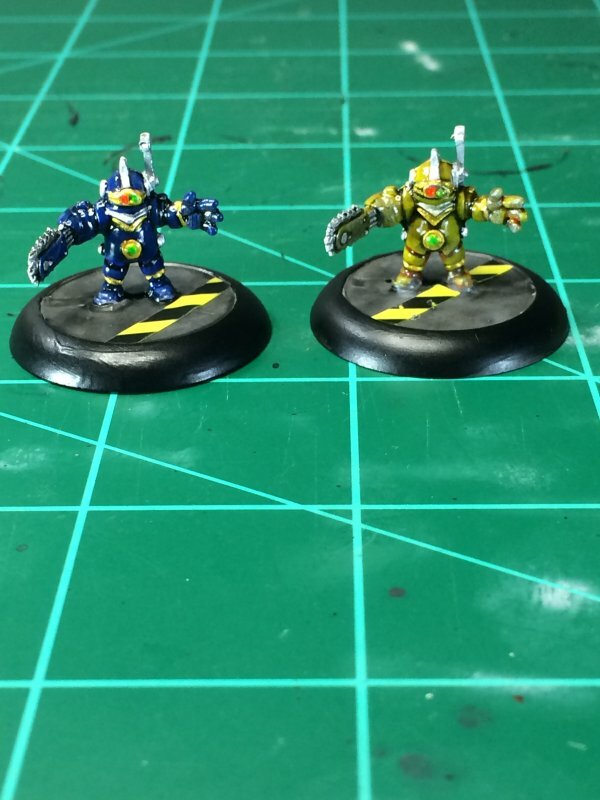 105 new minis got bought. 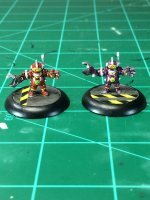 Net gain: 13 minis painted. That doesn't feel very productive. The crux of those additions come from the Star Trek Adventures RPG game (52 new minis). 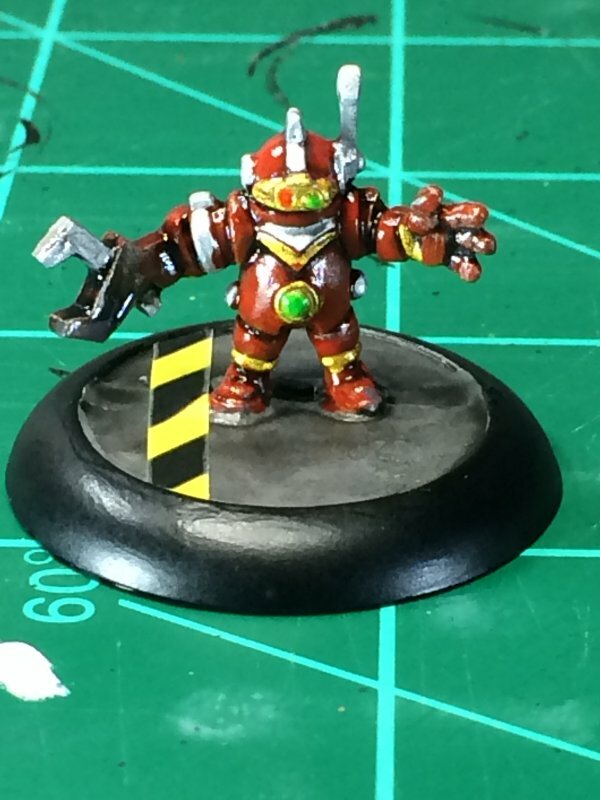 A game I'll likely not play, but I do want to paint those minis. Zpocalypse might be a typo along the way, unless there was a good sale somewhere that I forgot about. 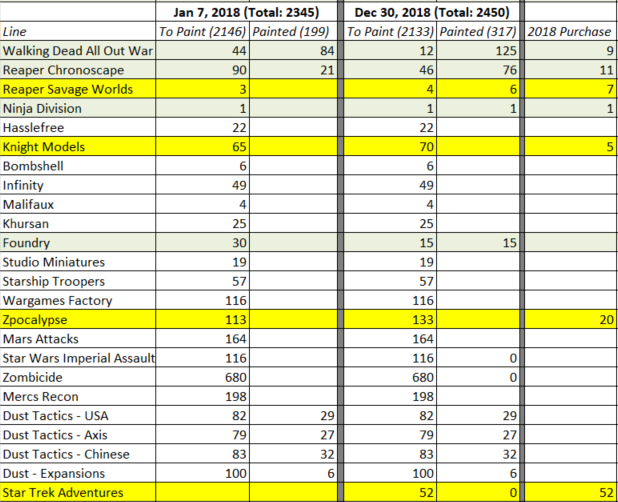 This doesn't include any of the scenery I made this past year. Scenery was something I didn't start out tracking so I don't really, at least easily, know how much progress I made there. I did make a lot of stuff, printed out a lot of stuff to go with it, and enjoyed it. The rest of the 2018 - honestly nothing really stands out. I'm ok with that. 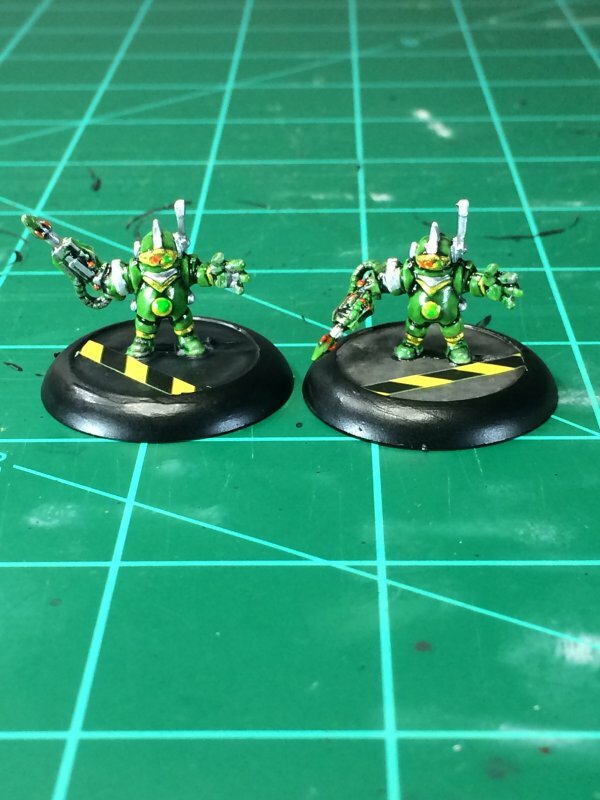 Hopefully more than a net gain of 13 minis painted. The first thing associated with that is that I'm going to look into taking a mini painting class at Lowe Mill which will force me to finally take the airbrush out of the box! I visited the place last week forthe first time, and think I would be comfortable learning from the folks there. The last time I took any type of art class would have been circa 1980. I'm still enjoying painting minis and scenery, so for now that's still going to be my hobby! This is also a big year for me in other ways. I've had Russellmania.com registered for 20 years, and a bug chunk of that has been my blogging hither and yon. At one point I had all the old version of the site saved off where I could reach it/them, but to be honest I'm not sure where those burned cds have gotten stashed to. In March I'll turn 50, and although I have no big celebratory plans I'll no longer be able to joke about being old. I'm going to be old. A couple of months after that, I'm scheduled to make my final mortgage payment. Now that is seemingly a big deal. With luck, the house won't fall apart before then. 2019 also brought something I've been expecting for a year and a half. At 7:30 this morning, my wireless router died. Luckily, I had a replacement waiting in the garage since something happened in April 2017 that made me think the then-8 year old router was going to die. The router ended up lasting a good 9 years. This morning while watching Supergirl on Netflix, the wireless connection went down and all the lights on the router were out. An hour later the new network was up and running. It took and extra hour and a half to get everything that's supposed to use the wireless network re-connected. Smart lights, Echo Dots, tablets - I just have lots of wirelessness. And I just remembered 2 laptops that have to be connected. That was a good router though. I greatly enjoy my DVD collection. I've been collecting, actually buying, them since 1997, starting with the first Starship Troopers movie. Somewhere along my path of life (I think when I was working in the video store) I decided that if I wanted to watch a movie I would just buy it in case I wanted to watch it more than once. With the advent of video on demand, that's not quite as cost effective as it used to be. Storage space for all these discs takes up room vs keeping everything in the cloud. It's actually easier to just click a button and buy/rent a movie when I want to watch it than the hassle of ordering a disc, waiting for it to ship, then remembering what shelf I put it on when I'm finally in the mood to watch it. My man-love for Kevin Smith is well documented, albeit waned a smidge over the past year as I finally got to the point where I'd seen/heard him talk enough that any given topic or snippet I'd seen/heard 75% of it before. This past year I went with Dr Blondie to see Kev at the Ryman, and 75% of what he talked about I'd heard on podcasts, twitter posts, or whatever other random path of information flows between he and I. I expected it. This event was about 3 months after his heart attack that didn't kill him, which he mentioned was being recorded for Showtime. I like Kevin's Q&A's more than his movies, the man can tell a good tale. If he's released a Q&A on disk, I've got it. The special for Showtime popped up a couple of months ago. I don't have Showtime, but I thought about getting it. In the end, I did not. A few weeks ago Kevin posted, on one of his many information flows between us, that iTunes was going to have his Silent But Deadly special on whatever date he mentioned. I've been cutting back my iTunes purchases, and use in general, but maybe I would start some digital downloading of Kevin? If iTunes has it, maybe he's releasing a disk? I went to Amazon and there in the available Blu-Ray section is Silent But Deadly! Click, bought, ship it to me, it was only $13! This next part is connected, trust me: As part of my Alexa Echo/Smart (Special Needs) Home 2018 Initiative, I upgraded my Amazon Music to Unlimited (oooh, snazzy, huh?) account to have what can only be described as "more stuff". I'm still amazed at what is actually available there. 1987 Open Sesame album by Whodini is there. I think I was the only person in Alabama that listened to that when it came out. On cassette. That I bought at Murphy's Mart. That detail isn't relevant other than Amazon streams some eclectic stuff. Remembering this, I searched for Kevin, and they did indeed have Silent But Deadly available for my listening pleasure. As such, I joyously listened! And I found that the hour that constitutes Silent But Deadly is the first hour that he talked about when he was in Nashville. It makes sense as far as a stand-up/speaker being on tour, but it was a little disappointing. I'd never thought of this being 100% the same. 100% the same of something I'd heard 75% of before. It's not a total wash - I re-listen to Kevin stories all the time, but that makes the expectation of hearing a golden nugget for the first time so much higher. Now the disk will go in the stack of everything else, and most likely forgotten for a long time. Hearing a story, paying to see it told in person, and then hearing it again when thinking it might be with something new - those stories will stick with you for a while before they'll get a chance to be heard, or seen, again.